Our Prague guided tours are all tailored to suit each booking, we do not allow for bookings to be joined. Our guided tours in the Czech Republic are all exclusive to each client. e-archietct can assist with sorucing architectural guides for your trip to the Czech Republic. Prague is a picturesque city with a well preserved historic centre. There are buildings here by Adolf Loos, Steven Holl (design interior – a reconstruction), Eva Jiricna and Frank Gehry. Some 200 km to the south-east (in Brno) is a classic building by Mies van der Rohe, one of his best works – Villa Tugendhat. There are some intriguing Cubist buildings dotted around the city and an enclave of Modernist buildings to the west. The most well known recent Prague architecture is definitely the Dancing House Prague aka ‘Fred and Ginger’ (above) designed by Frank Gehry with Vlado Milunic and completed in 1996. Typical of the architect’s work it is exuberant and flowing, and challenging to the historic architectural context. 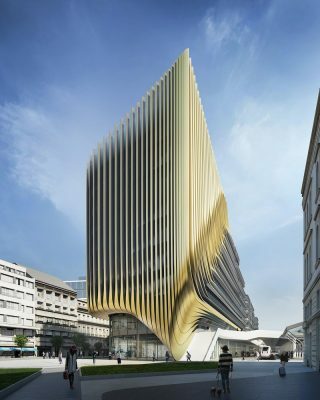 Another strong new building is Hotel Josef Prague (above) by Czech architect Eva jiricna whose main office is in london. This central hotel building has a grogeous spiral stair in the lobby, well worth a visit. 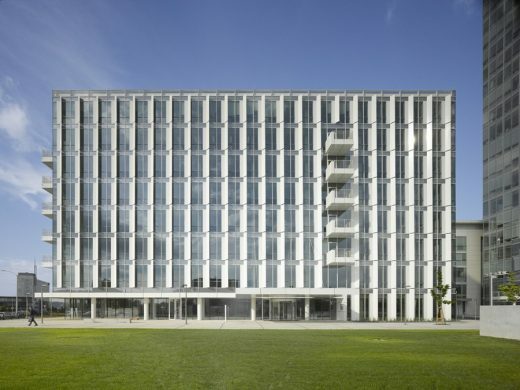 Key contemporary Prague architecture worth a visit include City Green Court, (below) in the Pankrác district designed by famous American architects Richard Meier & Partners and inspired by Czech Cubist architecture. This is the third of a cluster of buildings designed by Richard Meier & Partners and it completes the corner of the Radio Plaza superblock. The building is smaller in scale than its predecessor, City Tower. The recent Revitalisation of the Crucifix Bastion in Prague 2, by MCA atelier is located just east of the city centre. The Bastion is a part of the medieval fortifications of Prague. The goal of the architects in renewing the site was the landscaping of the public area, the addition of an open-air café and gallery on the site of a ruined 19th-century building and linking the spaces inside and outside the medieval fortification line. Finally we also suggest a visit to the Prague National Gallery Entrance Hall by the well known Barcelona architecture studio of Mateo Arquitectura. they have redeveloped a number of spaces including the connecting hall, main entrance of the National Gallery and access between the palaces Salm and Schwarzenberg. Also of interest are the small-scale interiors of the Franz Kafka Society (above) by architect Steven Holl (based in New York) and Marcela Steinbachová. There are also Cubist buildings dotted around the city, mostly towards the south close to the river, and then over in the west across the river there is a small Modernist enclave a bit like a mini version of Stuttgart’s Wesissenhofsiedlung – Modern Prague Buildings. Here can be found Modernist houses by architects such as Mart Stam. Prague Architectural Tours can focus on traditional or contemporary buildings or both. The Prague Architecture Tour can be an introduction to the city’s main buildings or can be tailored to your group’s interests. We can provide information on building types and geographical areas ahead of your tour, eg a group interested in new Prague office buildings could be advised thus allowing a tour itinerary to be agreed ahead of their visit to Czech Republic. e-architect also organise architecture walking tours in other central European cities such as Vienna, Bratislava and Belgrade.